Where Protectorshell needs to be secured to the underlying surface, the Protectorshell saddle clamp is designed for this purpose. Supplied in kit form with epoxy resin and stainless steel fasteners. The design takes into account the different metals used in anchoring to reduce the effects of galvanic corrosion. Ductile Iron to 400-15, as per industry standard for articulated pipe. 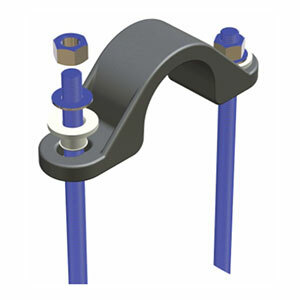 The insulation washer is integral at fastener location, allowing use of a wide range of fastener materials while minimizing effects of accelerated corrosion due to dissimilar metals. 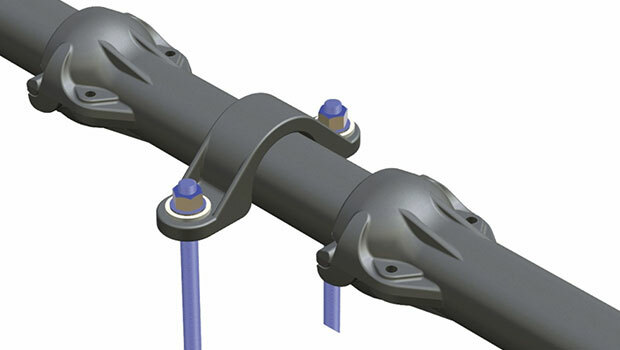 Can be supplied with a variety of fastening systems, suitable for a range of seabed from hard rock to softer rock options. Fasteners are exclusively 316 Stainless Steel which has a proven longevity in harsh environments. 150mm anchor studs embedded in rock with epoxy resin of tensile strength greater than 25mPa. Anchor studs up to 1000mm long embedded with either epoxy resin or underwater grade grout. Ground anchors up to 1500mm long embedded in seabed and pre-tensioned before use.